Ratatouille inspired baked orzo with seasonal eggplant, peppers, onions and tomatoes. Serve a crowd or use throughout the week for easy leftovers that pair well with just about anything. Peeling the tomatoes: Bring a small pot of water to a light boil and have a bowl of ice water ready on the side. On the side of the tomato that does not have an indentation, cut an X ⅔ of the way through the tomato. On the other side where the stem used to be, core the center as you would a strawberry, making sure not cut too deeply into the tomato. Place the tomatoes in the boiling water for about a minute, max. When the skin looks slightly loose, remove tomatoes and immediately place them in the ice water. After about 5 minutes in the bath, gently remove the skin and set aside to dry. In either a sauté pan or medium sauce pot, cook the orzo according to the instructions on the box or bag. Chop all of your vegetables (including the peeled tomatoes) to roughly 1.5 inch squares or cubes so that they are all uniform; making sure to keep them separate either in bowls or on your chopping board. In a medium sized skillet over medium heat, add a teaspoon of olive oil and your onions. Sweat until tender but have not changed in color and season lightly with salt. Add the chopped garlic and cook until aromatic. Pour the cooked onions and garlic into a large mixing bowl. Do this same process for all of your vegetables, allowing some color for the peppers and eggplant. Remember to season as you go. 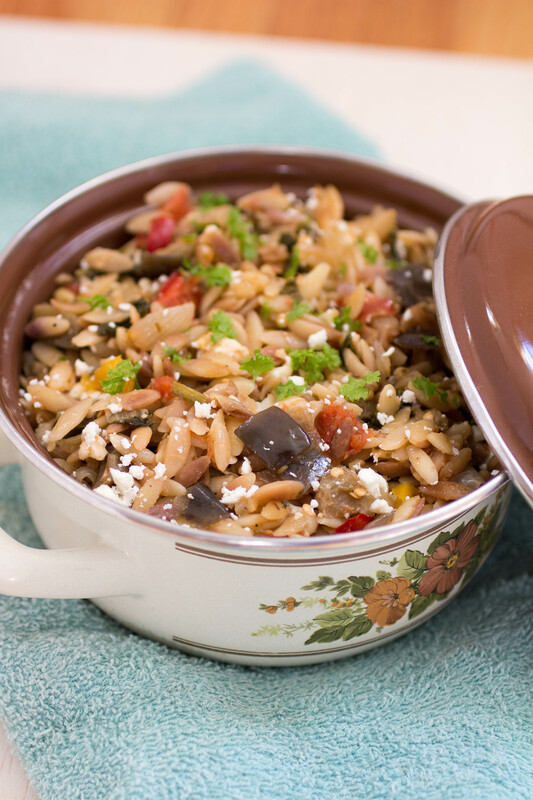 In bowl of your cooked vegetables, add the orzo, feta, half of the parmesan, oregano, and pepper. Toss well and pour into a large casserole dish. Sprinkle the top of the dish with the rest of the parmesan, and bake for about 20 minutes, or until the cheese has melted and browned slightly.